We took off from Columbus AFB on their 12,000 foot runway, of which I used 11,999 1/2 feet to get the wheels off the ground. We were at 3,500 feet left to go on the runway, throttles full power, nose wheels still hugging the ground, copilot calling out decision speeds, the weight of Atlantis now screaming through my fingers clinched tightly on the controls, tires heating up to their near maximum temperature from the speed and the weight, and not yet at rotation speed, the speed at which I would be pulling on the controls to get the nose to rise. I just could not wait, and I mean I COULD NOT WAIT, and started pulling early. If I had waited until rotation speed, we would NOT have rotated enough to get airborne by the end of the runway. So I pulled on the controls early and started our rotation to the takeoff attitude. The wheels finally lifted off as we passed over the stripe marking the end of the runway and my next hurdle (physically) was a line of trees 1,000 feet off the departure end of Runway 16. All I knew was we were flying and so I directed the gear to be retracted and the flaps to be moved from Flaps 20 to Flaps 10 as I pulled even harder on the controls. I must say, those trees were beginning to look a lot like those brushes in the drive through car washes so I pulled even harder yet! I think I saw a bird just fold its wings and fall out of a tree as if to say, "Oh just take me". Okay, we cleared the trees, duh, but it was way too close for my laundry. As we started to actually climb, at only 100 feet per minute, I smelled something that reminded me of touring the Heineken Brewery in Europe... I said, "Is that a skunk I smell?" and the veterans of shuttle carrying looked at me and smiled and said "Tires!" I said "TIRES??? OURS???" They smiled and shook their heads as if to call their Captain an amateur... okay, at that point I was. The tires were so hot you could smell them in the cockpit. My mind could not get over, from this point on, that this was something I had never experienced . Where's your mom when you REALLY need her? the air to stay level, and when you bank, it feels like the shuttle is trying to say, "Hey, let's roll completely over on our back!".. Not a good thing I kept telling myself. SO I limited my bank angle to 15 degrees and even though a 180 degree course change took a full zip code to complete, it was the safe way to turn this monster. After reaching Vero Beach, we turned north to follow the coast line back up to the Shuttle Landing Facility (SLF). There was not one person laying on the beach...they were all standing and waving! "What a sight," I thought... and figured they were thinking the same thing. All this time I was bugging the engineers, all three of them, to re-compute our fuel and tell me when it was time to land. They kept saying "Not yet Triple, keep showing this thing off" which was not a bad thing to be doing. However, all this time the thought that the landing, the muscling of this 600,000 pound beast, was getting closer and closer to my reality. I was pumped up! We got back to the SLF and were still 10,000 pounds too heavy to land so I said I was going to do a low approach over the SLF going the opposite direction of landing traffic that day. So at 300 feet, we flew down the runway, rocking our wings like a whale rolling on its side to say "hello" to the people looking on! One turn out of traffic and back to the runway to land...still 3,000 pounds over gross weight limit. But the engineers agreed that if the landing were smooth, there would be no problem. "Oh thanks guys, a little extra pressure is just what I needed!" So we landed at 603,000 pounds and very smoothly if I have to say so myself. The landing was so totally controlled and on speed, that it was fun. 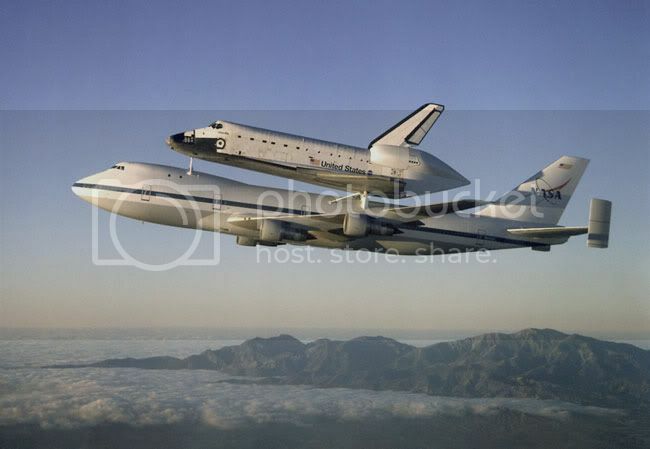 There were a few surprises that I dealt with, like the 747 falls like a rock with the orbiter on it if you pull the throttles off at the "normal" point in a landing and secondly, if you thought you could hold the nose off the ground after the mains touch down, think again...IT IS COMING DOWN!!! Then I turned on my phone after coming to a full stop only to find 50 bazillion emails and phone messages from all of you who were so super to be watching and cheering us on! What a treat! I can't thank y'all enough. For those who watched, you wondered why we sat there so long. Well, the shuttle had very hazardous chemicals on board and we had to be "sniffed" to determine if any had leaked or were leaking. They checked for Monomethylhydrazine (N2H4 for Charlie Hudson) and nitrogen tetroxide (N2O4). Even though we were "clean," it took way too long for them to tow us in to the mate-demate area. Sorry for those who stuck it out and even waited until we exited the jet.